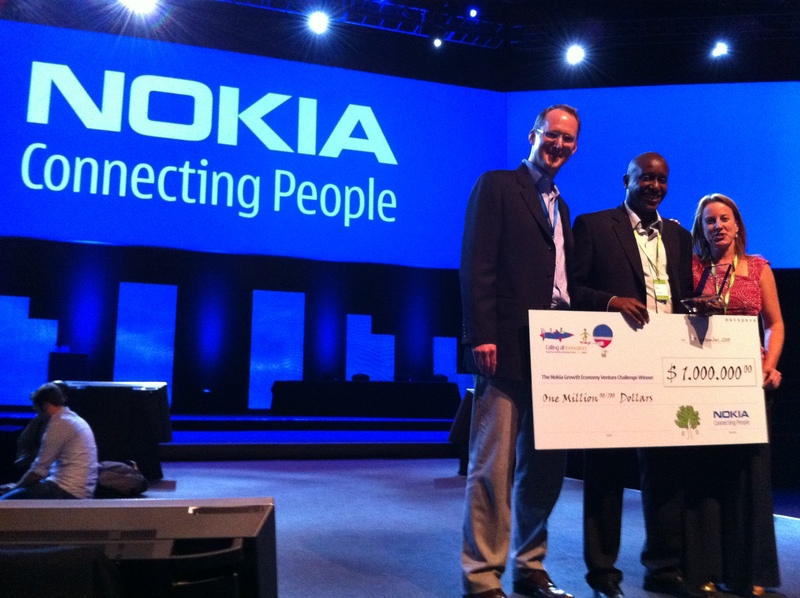 John Waibochi of Virtual City, from Kenya, won the Nokia $1,000,000 Growth Economy Venture Challenge here at Nokia World today. This is an investment of $1m in John’s business, so it comes with support and connections that only an organization of Nokia’s size can provide. The award was given out by Stephen Elop, Nokia’s new CEO, as the first action of his at Nokia – this sends a certain signal to all devs around the world. John Waibochi wins the Nokia $1m Challenge from WhiteAfrican on Vimeo. Virtual City Ltd, a home-grown Kenyan company, has developed a solution that aims at addressing systemic issues along the Supply Chain for distributors and retailers of Fast Moving Consumer Goods in emerging markets. The Mobile Distributor Solution is designed to contribute to improved efficiencies and value to all the stakeholders in the value chain and result in increased number of transactions, accurate records, improved Inventory management & reporting from the field and effective management decision making. The solution will also bring value to a large number of beneficiaries comprising of thousands of small and micro enterprises in the FMCG Market. It’s a product that can be monetized due to high demand by both retailers and distributors in Kenya. This is a very solid company, with a solid proposal. Seeing the video (not available yet) of this working with one of Africa’s leading beverage company’s was impressive. From a Nokia Challenge perspective, this provides a solution that will bring value to a large number of beneficiaries comprising thousands of small and micro enterprises in the Fast Moving Consumer Goods (FMCG) Market through the smart application of mobile business and cashless payment technologies. The project will generate revenue for the partners Virtual City and Nokia, while increasing the income levels of the stakeholders in the supply chain by opening up increased product sales coupled with additional benefits of mobile payment capabilities, transaction fees revenue, loyalty programs benefits, etc all facilitated by inexpensive and affordable mobile phones. The new found ability to transact via mobile phones and use cashless means to make payments for goods or services, has the potential of availing solutions that the over 6 million users of mobile payment solutions from the telecommunication players can access and utilize in their business dealings, the aim is to fully utilize the potential that a mobile phone has in adding value to the user. Launched at CES 2010 by Nokia CEO, Olli-Pekka Kallasvuo, Nokiaâ€™s Growth Economy Venture Challenge called on innovators from around the world to create a mobile product or service to improve the lives of people in developing nations and compete for the chance to win venture capital investment of $1 million. Why is Nokia holding the Growth Economy Venture Challenge? Nokia is a leader in enabling mobile technology to transform peopleâ€™s lives for the better (through projects like Nokia Life Tools, etc.). Efforts like The Progress Project and the Nokia Growth Economy Venture Challenge endeavor to show the mobile community what is possible in order to focus the entrepreneurial spirit of innovators on accelerating transformation in these areas of the world. We see this Challenge as a win for Nokia, a win for the developer that is selected, and a win for their customers. The mobile product, application or service must undeniably enhance the standard of living or lifestyle of the target customer. The target customer must be from a region of the world where the general daily per capita income is $5 USD or less. The organization that receives the $1 million USD investment must have shown that it has the potential to be a vibrant and successful business that will be profitable for itself and its investors (as judged through normal venture investment vetting procedures). Way to go! Congratulations to Virtual city team! Congratulations to John and his team! Another testament to innovation born in Africa :). Fantastic . Innovation and Entrepreneurship at the heart of Africa . Congrats John and the team at virtual city . Congratulations. Way to go Virtualcity. Congratulations Murags – to you and the entire VC team. Many years of hard work finally coming to fruition and the global recognition that comes with it … totally, totally deserved! Best wishes ….. and on to the next big thing. Absolutely fantastic. Congratulations to John Waibochi and his team. Global kudos … perseverance and passion at work. John, congratulate on your achievement. Amazing feat and congratulations to the Virtual City Team. Congrats John and the entire VC team. Innovation truly lives here! congratulations to them are in order . My former boss, a cut throat but a smart guy. Congratulations! And time for me to sayâ€¦Congrats! This is fantastic news and a great achievement. Well done to you John and the rest of your team at Virtual City. – This is a great testament to the virtues of passion and perseverance !! Murags, congrats for winning this award. It is truly incredible and a reflection of all your hardwork. I still remember the promises you made and the courage you had in launching Virtual City those many years ago. This is surely the reward for all that effort. Best wishes to you and the Virtul City team. A successful man is one who build a firm foundation on bricks passed to him by others. Virtual City staff have made history. John. Absolutely incredible! Well done. It’s absolutely terrific to see your innovation spirit and Virtual City’s accomplishments being rewarded so publicly and handsomely. Keep waving that flag! Brilliant. And to all the local developers , this is the success story you have all been asking me about. I nothing to say other than DAAAAMN!!! Fantastic John! Congratulations to you and the whole team at Virtual City. BTW your solution for Scarab is being put to excellent use as we expand our business in Latin America. Thanks a lot! Way to go!!! Congratulations John and the Virtual City team!!! This may just mark a Kenyan (that’s small… so.. African) Reconnaissance in the Technology field!! We’re proud of you!! Great stuff John, All the best with the full deployment. yet another one from Kenya. congrats John and VC. 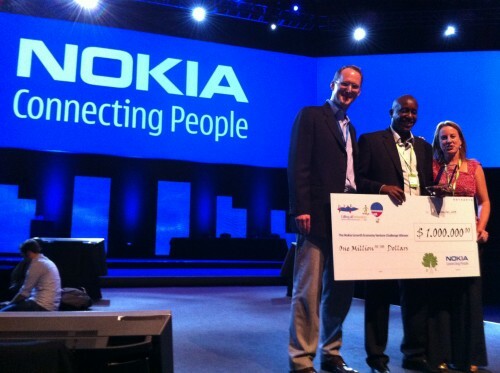 Congratulations Excited to have a Kenyan winning the Nokia Calling All Innovators Competittion. A good show of Nokia commitment to Developers and a testament that it is time for Africa. Ke Nako! Murags, I believe that it was 10 years ago that you asked me to officiate at the launch of your company. Very few in the audience could understand the vision you so clearly articulated. Everybody however understands a million dollars. Congratulations and keep dreaming about how to help the country get to the next level. Well done! And mad props to the guys behind the scenes that built the product. This victory belongs to them too. Definitely impressed and inspired. Watch me too, i’m working on Android and google summer of code project 2011. Congratulations John. You’ve made Kenya proud! Congratulations to a great team !Another feather to the Kenyan cap. You’ve just raised the bar even higher. Bravo! Congratulation John and the VC team that has made Kenya proud. Now other developers are encouraged by your feat and I know we will see more locally relevant apps that help empower our people. Erik, you have been preaching that message too and it was great celebrating what this win means for us in Kenya and Africa! Keep up the great work you are doing with developers! Well in Murags and team.Keep on its only the beginning of bigger and better things ahead. Well done John… in the true spirit of never giving up! It’s been a long journey and glad you came out tops. Keep coding to help millions!